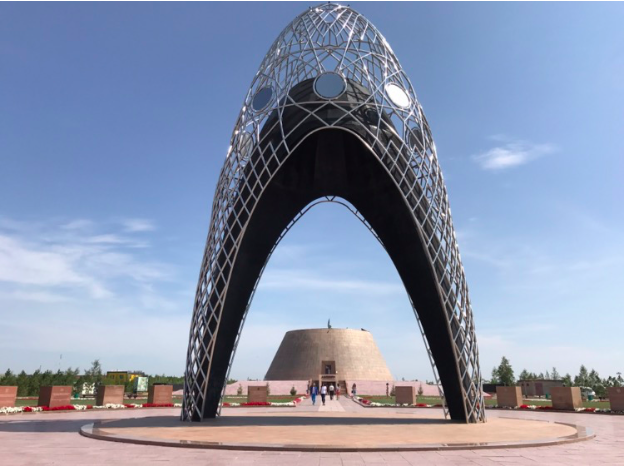 A few days ago, a group of student ambassadors visited the Akmolinsk Camp of Wives of Traitors of the Motherland, or ALZhIR for short, outside of Astana. On one hand, ALZhIR was just one island in the “Gulag Archipelago,” the Soviet Union’s infamous network of forced-labor camps. On the other hand, though, ALZhIR is unique, as it was one of the only camps specifically for wives, sisters, and mothers of “traitors of the motherland,” as the victims of the repression were officially called. Today, however, all that remains on the site of the camp is a museum memorializing the victims and a giant monument called the Arch of Sorrow. When you arrive at ALZhIR, you first walk under the Arch with your head bowed, signifying your respect to the camp’s victims. Then, you are free to walk around the site and enter the museum. Inside the museum, you are greeted with a highly symbolic display of a rose growing out of concrete and doves flying away from a barbed wire sculpture. Then, there are two floors with pictures and historical artifacts from the camp. We were lucky to have a tour guide for the museum, who was very knowledgeable and thorough. At first I was worried because she spoke very fast Russian, but I was really happy that I was able to keep up during most of her tour. As my first time visiting a Gulag camp, the experience was both moving emotionally and fascinating historically. It is one thing to learn about the Gulag system in Russian history courses and conduct research on it for academic papers, both of which I have done in the past. To experience a camp in person and learn about the specific history of that one site is something else entirely. It brings history to life in a way that is almost impossible to describe. If you are in or around Astana, I would urge you to visit the camp. Although it can be hard emotionally to spend time at a place like ALZhIR, I truly believe it is important to confront the dark parts of the past and learn from them.